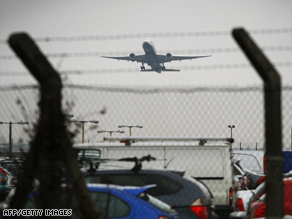 LONDON, England (CNN) -- The British government -- ignoring a firestorm of controversy -- Thursday approved construction of a third runway at London's Heathrow Airport, saying the move is essential for British business and would retain the airport's status as a major European hub. Backers argue the London airport's expansion could create 65,000 jobs. British Transport Secretary Geoff Hoon promised that while the third runway -- which won't open until 2019 at the earliest -- will increase Heathrow's capacity, noise and emission levels would nevertheless be reduced as Britain meets European Union targets. "Doing nothing at Heathrow would allow extra capacity at other hub airports like Frankfurt and Schiphol (Amsterdam) and Charles de Gaulle (Paris)," Hoon told Parliament. "Doing nothing will damage our economy and have no impact whatsoever on climate change." Heathrow currently operates at 99 percent capacity. The idea of a third runway has been discussed for years, but it has also generated lots of controversy among climate change activists and local residents. Construction of the runway would see areas around the airport -- including the entire village of Sipson and parts of two other towns -- razed to make room. "It is devastating for the people that live there, for the homes, the jobs, for the schools," Councilor Ray Puddifoot, whose borough of Hillingdon covers the affected towns, told CNN. "It's an immense decision, a totally unnecessary decision. This is (Prime Minister) Gordon Brown sucking up to business, and he's doing it at the expense of people, and at the expense of the environment." Environmental campaigners Greenpeace said earlier this week they had bought a piece of land earmarked for construction of the new runway in hopes of scuppering the government's plans. The group said it intended to divide the land into tiny pieces to be owned by supporters around the world in an attempt to slow down the planning process with hundreds of legal challenges. Geraldine Nicholson said the third runway will be just yards from her doorstep, and her children's school, Heathrow Primary School, will be demolished. The school was moved to its current location in 1966 to make way for the airport at the time, Nicholson said. "They thought it was far enough away that it would never be disturbed again," Nicholson told CNN. She and Puddifoot said they were determined to ensure the expansion plans "never see the light of day." They vowed to pursue legal action to stop it. Others opposed to the runway include more than 40 parliamentarians in the ruling Labor Party, government opposition parties, and London Mayor Boris Johnson, who has also pledged to go to court over the issue. Backers, who include the Unite and GMB unions, argue the airport's expansion could create 65,000 jobs. Unite is the largest union in the United Kingdom, with more than 2 million members in the public and private sectors. GMB has 600,000 members and is also a general union that anyone can join. Hoon said ongoing improvements to aircraft technology will ensure noise levels are reduced, and plans for improved transport links, including rail and subway lines, will ensure greater access to the airport. He also promised that Britain would be able to meet strict EU air quality targets even with the third runway. The government said it turned down proposals for "mixed mode" on the two existing runways, which would allow both takeoffs and landings. Without that option, CNN Aviation Correspondent Richard Quest said, a third runway is the only way to address Heathrow's capacity problems. "There is simply no room for further flights," he said. "No amount of building extra terminals solves that problem. The only way that problem is solved is either with more efficient use of existing runways or building new tarmac."